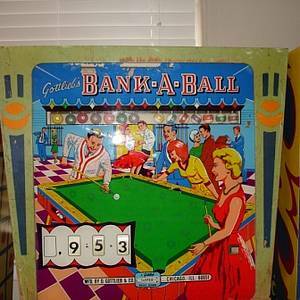 'Bank-A-Ball' was the first pinball machine produced with flipper return lanes, which are wireforms that allow the ball to roll behind the slingshot and towards a waiting flipper. 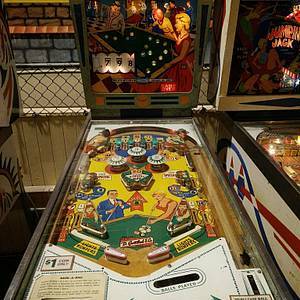 According to the book All About Pinball, Paradise and its add-a-ball version Pleasure Isle were the first games designed to have return lanes. However, Gottlieb rescheduled the production of Bank-A-Ball so that it could be released first. This game has received 22 approved Pinsider ratings and currently has a rating of 8.379 out of 10. This game ranks #6 in the Pinside EM Top 100. 16 Pinsiders have this game on their wishlist.